Every time I pass this Sun Trust Building on 15th St and New York Ave NW I am amazed by its brass rotunda. Every time I see brass I think of sailors polishing it. Really ... every time. I pass by this building a lot but never get a photo. 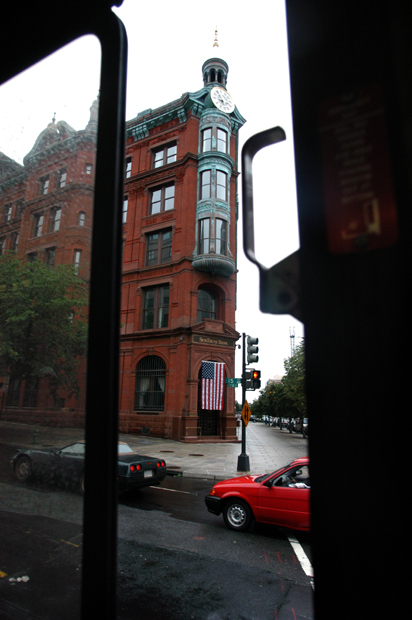 Today, before we passed the building, I reached in front of me and opened up the bus window, then hopped into the seat in front of me and shot back at the building as we passed by. I hopped back into my seat and closed the window. I heard some lady on the bus say I was probably "some kind of secret agent."